Background: Hyponatremia is generally defined as a serum sodium level <135 mmol/L and is considered severe if serum sodium is <125 mmol/L. Hyponatremia is a potentially life-threatening medical comorbidity for patients with schizophrenia. The incidence of hyponatremia in patients with schizophrenia who are taking second-generation antipsychotics (SGAs) has not been well established. Methods: We conducted a systematic review of case reports of hyponatremia associated with the use of SGAs in patients with schizophrenia. We searched MEDLINE (from 1946 through September 2016) using the medical subject headings antipsychotic agents, hyponatremia, and water intoxication to identify reported diagnoses of hyponatremia following treatment with SGAs in patients with schizophrenia. Results: We abstracted 12 potentially relevant case reports from 157 records. Nine case reports met the selection criteria. Three cases involved the use of aripiprazole (Abilify), 3 involved the use of risperidone (Risperdal), and the other 3 cases involved ziprasidone, olanzapine, and clozapine. Approximately equal numbers of males and females were represented, and 2 of the 9 patients were aged ≥60 years. The average patient age was 47 years, and the average time to the hyponatremia event was 17 days. The average serum sodium was 138 mmol/L at baseline, 112 mmol/L at treatment nadir, and 138 mmol/L after treatment discontinuation. Conclusion: Hyponatremia can result from the use of SGAs in patients with schizophrenia and can be avoided with proper management of treatment. Physicians, psychiatrists, and other healthcare workers should be aware of the potential for severe hyponatremia with the use of commonly prescribed SGAs. SGA-induced hyponatremia is generally reversible after discontinuing treatment. Schizophrenia is a chronic debilitating psychiatric illness occurring in approximately 1% of the world's population.1 Hyponatremia affects 4% of patients with schizophrenia,2,3 even without the use of antipsychotic medications, and occurs in 10% of patients with chronic schizophrenia who take antipsychotic medications.4 The use of antipsychotic medications may put patients with schizophrenia at an increased risk of developing hyponatremia.2,4 The occurrence of hyponatremia among patients with schizophrenia who are taking second-generation antipsychotics (SGAs) in the clinical setting has not been well established and warrants further research. 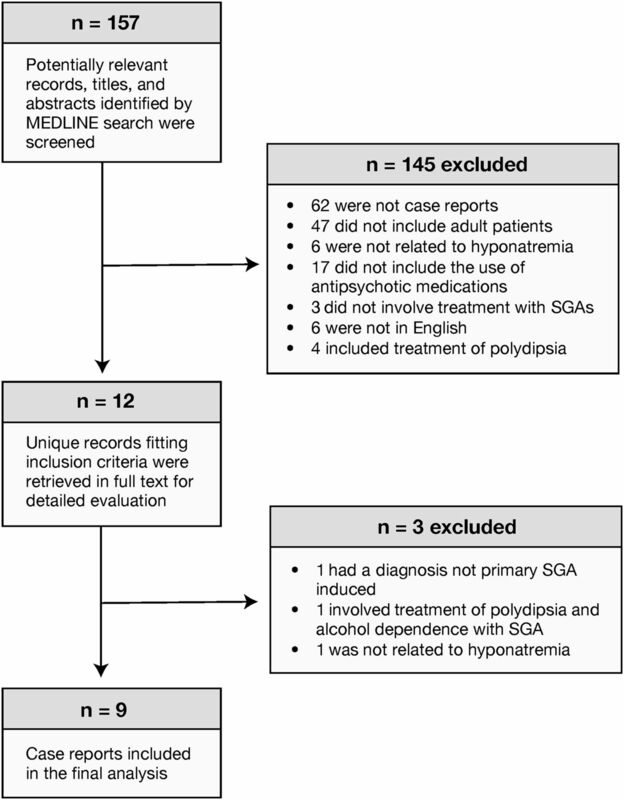 The purpose of this systematic review was to examine published cases reporting the use of SGAs and the occurrence of hyponatremia in patients with schizophrenia to inform physicians prescribing SGAs. We conducted a literature search of the MEDLINE database (from 1946 through September 2016) using the medical subject headings antipsychotic agents, hyponatremia, and water intoxication to identify cases reporting a diagnosis of hyponatremia after treatment with SGAs in patients with schizophrenia. The search was limited to articles in the English language. Inclusion criteria were (1) a case report (2) describing hyponatremia (a serum sodium level <135 mmol/L) that (3) occurred after the start of treatment with one or more SGAs.1 Exclusion criteria were (1) serum sodium level was not reported, (2) a clear diagnosis of schizophrenia was not documented, (3) an SGA was not administered, and (4) the subject of the report was not a human adult. Our search yielded 157 unique titles that we screened by title and abstract to identify 12 pertinent case reports. These 12 potentially relevant cases were extracted in full text and evaluated in detail. Cases were excluded according to the previously described criteria. Nine case reports were selected for analysis, and data were abstracted. The Figure illustrates the selection process for the cases. Figure. Flow diagram shows the number of articles identified and evaluated during the case report selection process. SGA, second-generation antipsychotic. The 9 cases that met the inclusion criteria involved 5 male patients and 4 female patients with a mean age of 47 years. The patients' ages ranged from 20-76 years.15-23 Table 2 presents a summary of the cases with outcomes, author comments, and recommendations. Three cases reported the use of risperidone (Risperdal),16,19,23 3 reported the use of aripiprazole (Abilify),15,21,22 and the remaining 3 cases reported the use of ziprasidone (Geodon),17 clozapine (Clozaril),20 and olanzapine (Zyprexa).18 Recovery from hyponatremia after discontinuation of SGA treatment was reported in 8 cases. The patient taking olanzapine died from hyponatremia/water intoxication that was likely associated with the use of the drug. The patients' mean serum sodium level at baseline was 138 mmol/L, with a mean drop to 112 mmol/L and a mean return to a normal serum sodium level of 138 mmol/L following the discontinuation of treatment. Table 3 presents the serum sodium levels by case. Table 4 reports recommended dosages, actual dosages used in the case scenarios, and the times to the hyponatremia event. All of these severe cases of hyponatremia occurred in patients who were dosed within the recommended SGA dosing ranges, except for the case involving olanzapine (Zyprexa). That patient was administered approximately 4 times the recommended maximum dose, and the result was death.15-23 The average time to the hyponatremia event for all cases was 17 days. The authors of all 9 case reports proposed a link between the hyponatremia event and the use of SGAs based on the temporal relationship and the lack of an alternative explanation. The cited cases involved 7 adults aged 20-56 years and 2 elderly patients aged 60 and 76 years. The case report findings describing hyponatremia following SGA treatment represent a likely association; however, the absolute risk of this adverse event is currently unknown. From examination of the literature and our results, higher dosage treatment regimens with SGAs appear to be related to adverse effects. Regardless of the underlying cause, hyponatremia is associated with a risk of death.2,6,23 The electrolyte imbalance is likely to increase morbidity and mortality if left untreated.10,30-33 In addition, distinguishing the symptoms and signs of schizophrenia from hyponatremia-related neurologic deterioration may be difficult.3,9 Our findings suggest the importance of monitoring this electrolyte disorder closely within the first 2 weeks of SGA treatment initiation (given our average time to event of 17 days) and the importance of following proper dosing information within the first 3 days of treatment (our minimum time to event was 3 days). In clinical practice, the SGAs commonly prescribed to treat patients with schizophrenia differ in drug composition and safety profile; however, commonly prescribed SGAs and those included in this review (clozapine, risperidone, aripiprazole, ziprasidone, and olanzapine) block cerebral dopamine pathways to treat the symptoms of patients. Because hyponatremia is life-threatening in severe cases but is preventable in most cases with the discontinuation of SGA treatment, monitoring electrolyte levels during treatment with SGAs is important. Serum sodium levels returned to normal following the discontinuation of treatment in almost all the cases in our review. Increasing the awareness among psychiatric providers of this potential serious adverse event associated with SGAs is critical because of the prevalence of these medications in treating vulnerable patients with schizophrenia.
. Psychopharmacology: Drugs, the Brain, and Behavior. 2nd ed. Sunderland, MA: Sinauer Associates; 2013.
. Hyponatraemia as an adverse drug reaction of antipsychotic drugs: a case-control study in VigiBase. Drug Saf. 2010 Jul 1;33(7):569-578. doi: 10.2165/11532560-000000000-00000.
. Antipsychotic-induced hyponatraemia: a systematic review of the published evidence. Drug Saf. 2010 Feb 1;33(2):101-114. doi: 10.2165/11319070-000000000-00000.
. Antipsychotic use is a risk factor for hyponatremia in patients with schizophrenia: a 15-year follow-up study. Psychopharmacology (Berl). 2017 Mar;234(5):869-876. doi: 10.1007/s00213-017-4525-4529. ; Hyponatraemia Guideline Development Group. Clinical practice guideline on diagnosis and treatment of hyponatraemia. Eur J Endocrinol. 2014 Feb 25;170(3):G1-G47. doi: 10.1530/EJE-13-1020.
. Hypernatremia. N Engl J Med. 2000 May 18;342(20):1493-1499.
. Hyponatremia in psychiatric patients: update on evaluation and management. Harv Rev Psychiatry. 2008;16(1):13-24. doi: 10.1080/10673220801924308. Epidemiology, symptoms, and treatment characteristics of hyponatremic psychiatric inpatients. J Clin Psychopharmacol. 2013 Dec;33(6):799-805. doi: 10.1097/JCP.0b013e3182a4736f.
. Hyponatraemia and the syndrome of inappropriate antidiuretic hormone secretion (SIADH) induced by psychotropic drugs. Drug Saf. 1995 Mar;12(3):209-225. First-Generation Versus Second-Generation Antipsychotics in Adults: Comparative Effectiveness. Rockville (MD): Agency for Healthcare Research and Quality (US); 2012 Aug. http://www.ncbi.nlm.nih.gov/books/NBK107254/. Accessed November 21, 2017.
; Schizophrenia Patient Outcomes Research Team (PORT). The 2009 schizophrenia PORT psychopharmacological treatment recommendations and summary statements. Schizophr Bull. 2010 Jan;36(1):71-93.
; American Psychiatric Association; Steering Committee on Practice Guidelines. Practice guideline for the treatment of patients with schizophrenia, second edition. Am J Psychiatry. 2004 Feb;161(2 Suppl):1-56.
. Schizophrenia: overview and treatment options. P T. 2014 Sep;39(9):638-645.
. A challenging case of syndrome of inappropriate secretion of antidiuretic hormone in an elderly patient secondary to quetiapine. South Med J. 2007 Aug;100(8):832-833.
. Aripiprazole-induced syndrome of inappropriate antidiuretic hormone secretion (SIADH). Am J Ther. 2006 Jul-Aug;13(4):370-372.
. SIADH induced by two atypical antipsychotics. Int J Geriatr Psychiatry. 2000 Mar;15(3):282-3. Erratum in: Int J Geriatr Psychiatry. 2000 Jul;15(7):667.
. A patient using ziprasidone with polydipsia, seizure, hyponatremia and rhabdomyolysis. Prog Neuropsychopharmacol Biol Psychiatry. 2006 Dec 30;30(8):1535-1538.
. Fatal water intoxication during olanzapine treatment: a case report. Leg Med (Tokyo). 2014 Mar;16(2):89-91. doi: 10.1016/j.legalmed.2013.12.003.
. High-dose risperidone induced latent syndrome of inappropriate antidiuretic hormone secretion with seizure presentation. Clin Neuropharmacol. 2015 Jul-Aug;38(4):154-155. doi: 10.1097/WNF.0000000000000095.
. Clozapine and hyponatraemia. Lancet. 1992 Sep 12;340(8820):672.
. Antipsychotic-induced hyponatremia: case report and literature review. Am J Ther. 2008 Sep-Oct;15(5):492-494. doi: 10.1097/MJT.0b013e31817276e9.
. Aripiprazole associated hyponatraemia. Aust N Z J Psychiatry. 2011 Aug;45(8):686-687. doi: 10.3109/00048674.2011.580453.
. Risperidone and hyponatremia: a case report. Ann Clin Psychiatry. 1997 Sep;9(3):181-183. Atypical antipsychotic medications and hyponatremia in older adults: a population-based cohort study. Can J Kidney Health Dis. 2016 Apr 11;3:21. doi: 10.1186/s40697-016-0111-z.
. Incidence and prevalence of hyponatremia. Am J Med. 2006 Jul;119(7 Suppl 1):S30-5.
. The influence of age on the renal response to water deprivation in man. Nephron. 1976;17(4):270-278.
. Age and gender as risk factors for hyponatremia and hypernatremia. Clin Chim Acta. 2003 Nov;337(1-2):169-172.
. Hyponatremia and hypernatremia in the elderly. Am Fam Physician. 2000 Jun 15;61(12):3623-3630.
. Hyponatraemia associated with psychotropic medications: a review of the literature and spontaneous reports. Adverse Drug React Toxicol Rev. 2002;21(1-2):17-29.
. Adverse endocrine and metabolic effects of psychotropic drugs: selective clinical review. CNS Drugs. 2009 Dec;23(12):1003-1021. doi: 10.2165/11530020-000000000-00000.
. The prognosis of hyponatremia at hospital admission. J Gen Intern Med. 1986 Nov-Dec;1(6):380-385.
. The outcome of hyponatremia in a general hospital population. Clin Nephrol. 1984 Aug;22(2):72-76.
. Serious hypernatraemia in a hospital population. Postgrad Med J. 1988 Jun;64(752):441-443.